Our Australian bike tour is complete. 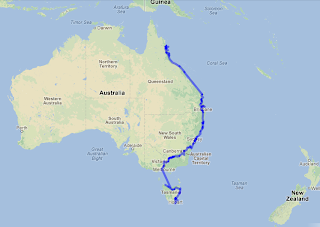 We have ridden from Cairns in Queensland to our most northern point Cape Tribulation at a latitude of 16˚,4´South and from there to Port Arthur in Tasmania at a latitude of 43˚,1´South, our most southern point. Projected on the northern hemisphere in “our own” region this could be compared with from Dakar in Africa to Carcassonne in the south of France. 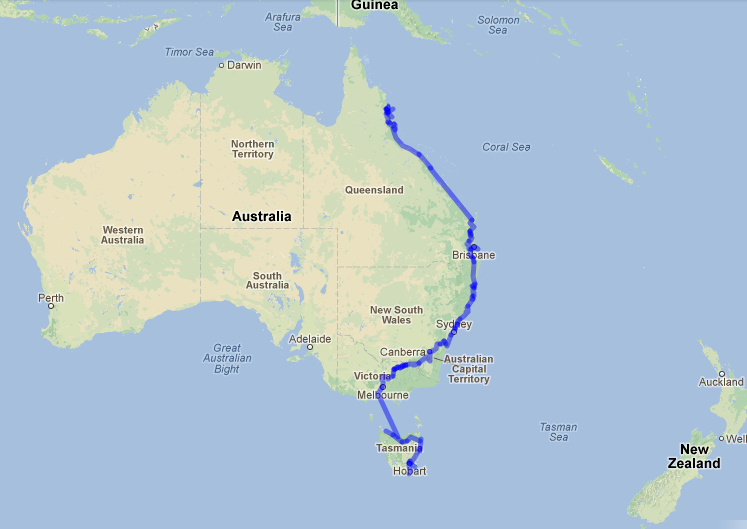 As the crow flies it's about 3000 kilometers, but for us on the ground it meant roughly 6500 kilometers. This took us 4 months and 20 days. We did not cycle all these kms, we only pedalled 5000 k, and that is a quite exact number. (Compare: Breda – Teheran). The other k's we did by bus, train, car and ferry. Most of the time we camped, 76 nights in our little tent. Once in the garden of a private house, sometimes on rest areas without any facilities but a creek, sometimes on so-called showgrounds, these are grounds where the local horse race track, soccer- and criketfields, swimming pool etc. are and where there mostly are toilets and showers. But most of the camping we did in caravan parks. In Europe we would call them campings or campsites. The caravan parks are similar to their European equivalent but for one thing: they have free barbeques and campkitchens. These can be very complete, with ovens, microwaves, barbeques, electric hot plates or gas stoves, freezers and fridges, water boilers, cutlery, pots and pans, sinks etc. Sometimes they are just basic and poorly equipped and even dirty. But most of the time they were good to excellent, we hardly ever used our own little gas stove. There are not many tents in a caravan park, it's mostly caravans (much bigger ones than in Europe) and campervans. Since these campers have all facilities with them, we often had the camp kitchen for ourselves. We also stayed a number of nights in motels, pubs and cabins, one night in a bus and one on a boat. But what we will remember most of all of this tour is the unbelievable hospitality of the Australians. Through Warmshowers.org we contacted all in all 15 different hosts and alltogether we spent over 50 nights in their safe and cosy homes. In some occasions we stayed a number of days in a house while the hosts themselves were not there at all. For us the Australians rank first and foremost as the most hospitable people we have ever encountered. Being so often in such close contact with the people in this country, this tour really made us get deeper in the culture and into daily life. We have experienced that this is an egalitarian and open society and that getting in touch with people is easier than in many other parts of the world. In this sense Australia is a very easy country. Though we have cycled quite a distance we have only seen a small part of the country. We were never very far away from the coast (max app. 300 k I think). So we have seen and can confirm that the country has fantastic beaches, and very many of them. We have seen and felt the openess of Queensland and the forests, hills, mountains and agricultural areas there and in three other of the six states. There is an abundance of nature, national parks all over. We have not seen the outback, the west and the north. But that Australia is a country with lots of beauty we will confirm. Yet we find that it is not an easy country for the cyclist. Very often the distances between places and facilities is very great. This makes long distances necessary, with nothing in between. Then, besides north Queensland (and the great outback where we didn't ride), there is no flat road to be found. It's often very hilly and roads are very undulating, with steep hills following one after the other. That makes cycling very hard and tiring. It's not the same everywhere though, we found Victoria and especially Tasmania easier than the other states. Australia is only for advanced bike tourers, we would say.